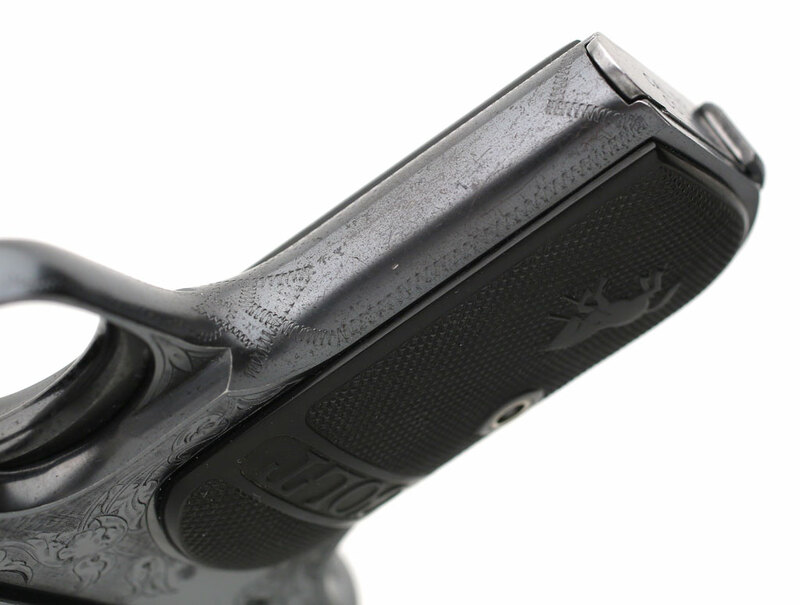 Colt Model 1903 Pocket Hammerless .32 ACP factory master engraved - serial number 382938, factory master engraved and gold inlaid "EJM" on the top of the slide by William H. Gough with factory black hard rubber stocks, blued finish. Engraved with Gough's distinctive floral and vine design of engraving and fine lined background. This is similar to another Gough engraved Colt Model 1903 Pocket Hammerless .32 ACP sn 293494 but for the gold inlay. Colt Model 1903 Pocket Hammerless .32 ACP - (right side) serial number 382938, factory master engraved and gold inlaid "EJM" on the top of the slide by William H. Gough. 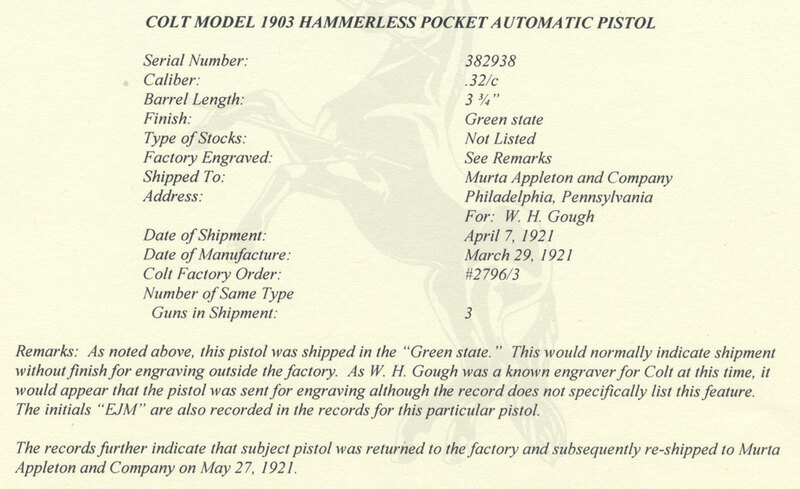 Colt Model 1903 Pocket Hammerless .32 ACP - factory letter indicates that Colt Model 1903 Pocket Hammerless .32 ACP pistol was shipped in the green state to Murta Appleton and Company, Philadelphia, Pennsylvania for W.H. Gough on April 7, 1921. The date of manufactured was March 29, 1921. It was processed on Colt Factory Order # 2796/3, Number of Same Type Guns in Shipment: 3. Remarks: As notes above, this pistol was shipped in the "Green state." This would normally indicate shipment without finish for engraving outside the factory. As W.H. 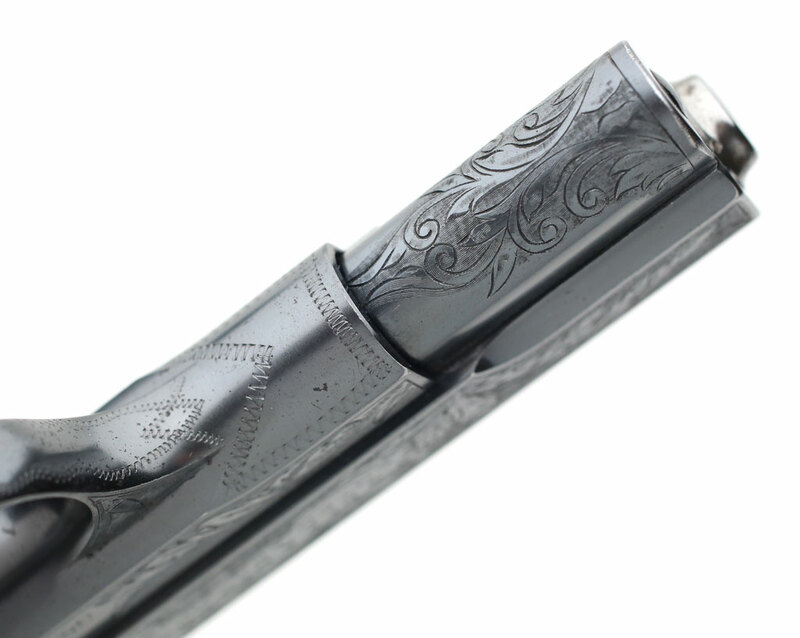 Gough was a known engraver for Colt at this time, it would appear that the pistol was sent for engraving although the record does not specifically list this feature. 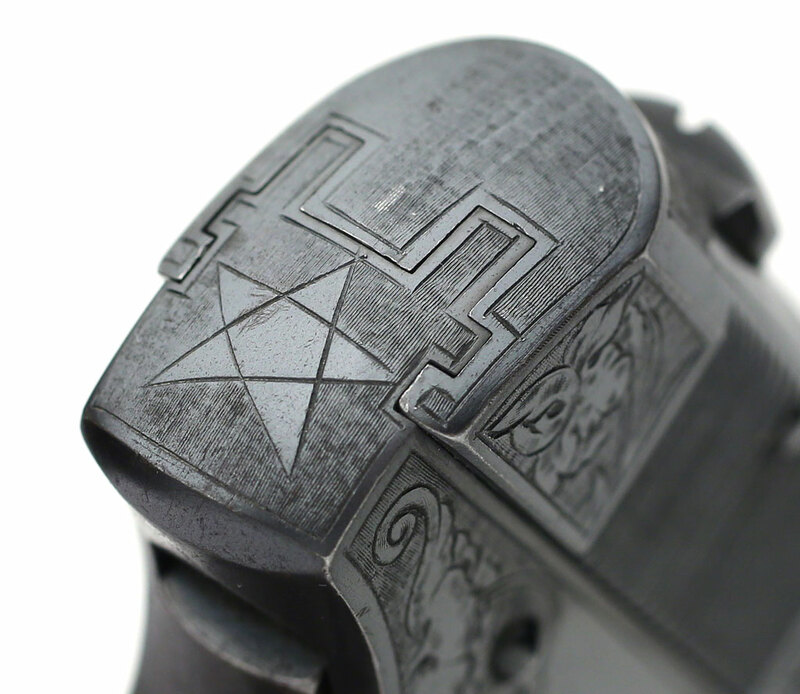 The initials "EJM" are also recorded in the records for this particular pistol. The records further indicate that subject pistol was returned to the factory and subsequently re-shipped to Murta Appleton and Company on May 27, 1921. Colt Model 1903 Pocket Hammerless .32 ACP factory master engraved - (right side) serial number 382938, factory master engraved and gold inlaid "EJM" on the top of the slide by William H. Gough with factory black hard rubber stocks, blued finish. Engraved with Gough's distinctive floral and vine design of engraving and fine lined background. 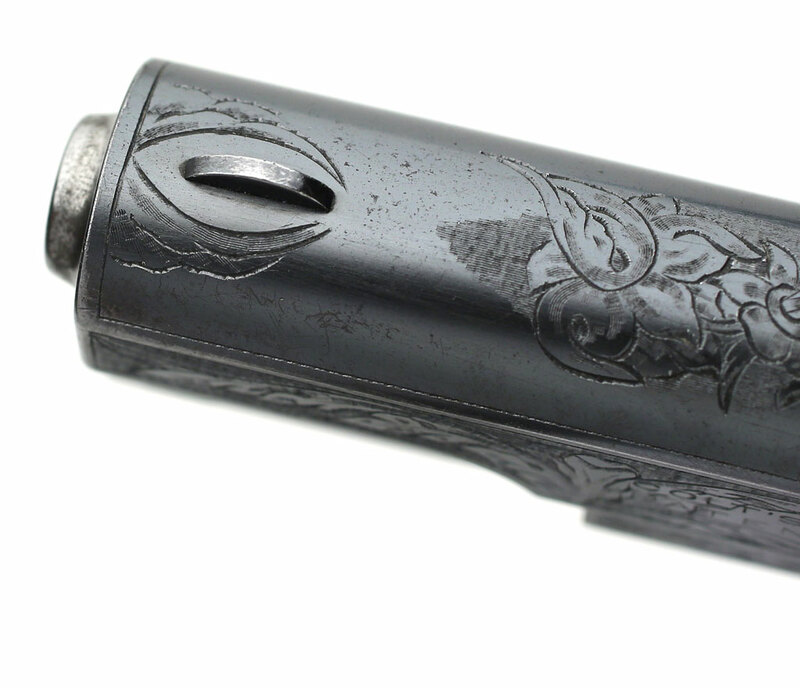 Colt Model 1903 Pocket Hammerless .32 ACP factory master engraved - serial number 382938, factory master engraved by William H. Gough, distinctive five pointed star engraved on rear of frame. This star appears on other known examples of Gough's work. 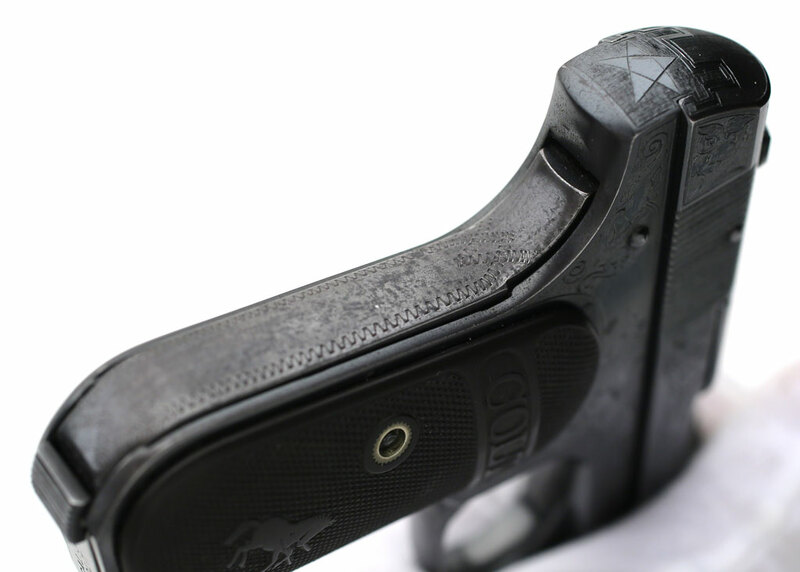 Colt Model 1903 Pocket Hammerless .32 ACP factory master engraved - serial number 382938, factory master engraved by William H. Gough, factory gold inlaid initials "EJM" most likely representing "E.M.J." as the larger middle initial typically signifies the last name. 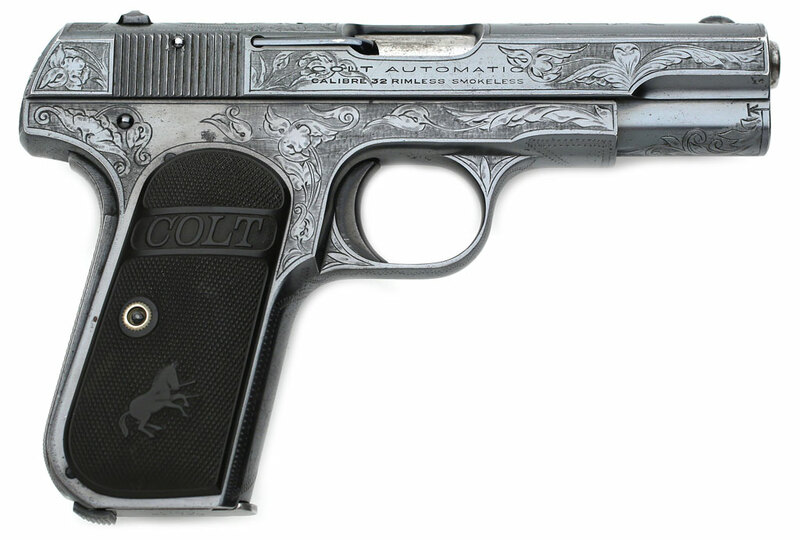 Colt Model 1903 Pocket Hammerless .32 ACP factory master engraved - serial number 382938, factory master engraved by William H. Gough. Close-up of underside of frame. Colt Model 1903 Pocket Hammerless .32 ACP factory master engraved - serial number 382938, factory master engraved by William H. Gough. Close-up of forward top of slide and front sight. Colt Model 1903 Pocket Hammerless .32 ACP factory master engraved - serial number 382938, factory master engraved by William H. Gough. Close-up of grip safety. 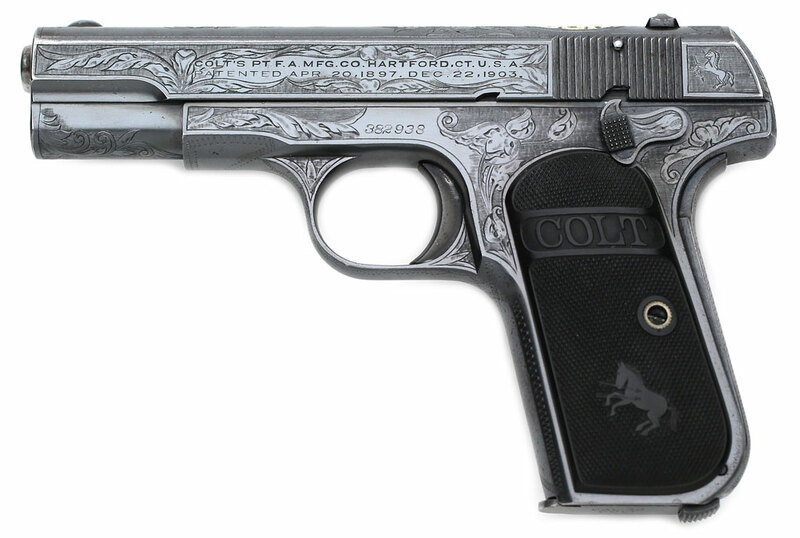 Colt Model 1903 Pocket Hammerless .32 ACP factory master engraved - serial number 382938, factory master engraved by William H. Gough. Close-up of front grip strap.